Written by Rosemarie Parent for the Arrow Lakes News – from the Society’s books and archival information. Like most small towns in the early days, before there were enough people to support a hospital, a family home was redesigned to become a Cottage Hospital. All born in the first hospital. Back Row, L-R: Hazel (nee Herridge) Fellows, Molly (nee Islip) Harris, Marie (nee Green) Gregory. Front Row: Margaret Nelson. Where the Markholms’ live now (2005) on the corner of 1st Street and 6th Avenue across from Kal Tire, is where the Cottage Hospital was situated. In 1908, the newly formed Nakusp Hospital Society had sent an application to the provincial government for financial aid, which when approved made the opening of the Cottage Hospital possible. Vegetables, fruit, butter, eggs, baked goods, linens and any other item that the hospital could use was brought in by everyone in the area, including the surrounding towns. It helped to keep costs down and when the new hospital was built in 1924, this help continued. Dr. Arthur Mossman was the first resident doctor and when he left Dr. MacPherson took his place in 1914. However he was only there for a year and Dr. Ernest McLean, who had been practicing in Revelstoke since 1892, was persuaded to come to Nakusp in 1916. He also took over Wakelin’s Drug Store to become the druggist as well as physician. When May Kennedy left in 1912, Miss Lightburn became the second matron during Dr. MacPherson’s stay and for part of Dr. McLean’s early years. Emily Grigg assisted Dr. McLean in minor surgery and attending births. She also had served as midwife during the times when there were no doctors. At the time of the 1918 flu, the little hospital was overloaded with patients and it was realized that a properly constructed and outfitted building was needed. By 1922, it also was evident that a larger hospital was necessary because patients from surrounding towns also came to the Cottage Hospital for care. The Hospital Board decided to recruit citizens up and down the lake for funding and to put forth a request to the government for financial help towards a new hospital. 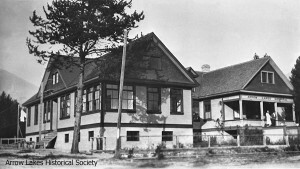 Second hospital, built in 1924, where Halcyon Home is now. In March of 1924, financial arrangements were completed with the bank, whereby the Board was granted a loan of $3,000 over a term of two years, $1,500 to be repaid in 12 months and the balance in two years. The building fund had $700 to its credit, also $700 which had been donated by members of the Board. The government advanced 40 percent of all monies spent, which meant that for every $100 spent, they would give $40 towards the building. Events were held from 1922 on where money earned was put toward the fund. L.H. Rawlings and G.H. Gardner were the successful bidders for the contract to build the hospital for a total cost of $6,800. The site chosen for the building is where Halcyon Home is now situated on Broadway. The building progressed quickly with five private wards, one general ward, two lavatories, two bathrooms, surgery, reception room, sitting room, pantry and kitchen. There was a full basement with an efficient furnace installed. Before the hospital was finished, the untimely death of Dr. McLean brought an emergency to the area. Dr. Basted replaced Dr. McLean for a short time and then Dr. Emerson followed until 1927. On October 22nd 1924, the last baby to be born at the Cottage Hospital was Hazel Fellows (nee Herridge). The transition from the old to the new hospital took place gradually with no news report of an official opening. A little over two weeks later, Bruce Ramsay was the first baby to be born at the new hospital. When Dr. Emerson left in 1927, Dr. Jackson practiced here for two years and when he left, Dr. Treman replaced him until 1942. Dr. Fred Maxfield came to Nakusp in 1946 and stayed for the rest of his life. He was a caring and qualified doctor and he and his wife, Beth, loved the rural living and settled into a very busy life. He is most remembered for his excellent care of maternity patients. When he died unexpectedly in 1970, the town and area mourned. This first hospital served the communities well for 50 years but with an increased population, the Hospital Board decided that a new facility was needed and meetings and forums took lace. It wasn’t until January of 1974 that Stan Fellows, chairman of the Arrow Lakes Hospital Society, turned the sod to begin construction of a new hospital at property owned and given to the board from the Spicers. 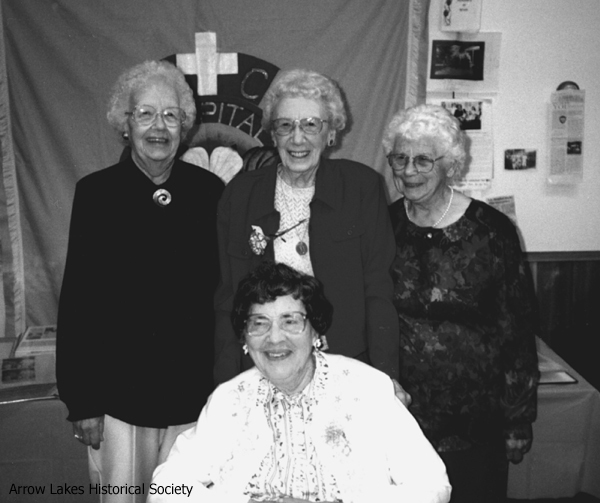 On March 8, 1975, the official opening of the Arrow Lakes Hospital was held. Over the years since then, a laboratory has been added which has greatly helped with quick diagnosis. There was no need to go out of town for most of the work that needed to be done. A new X-Ray machine replaced the old one and equipment, new beds and linens were bought as funding was available, mostly due to the work of the Hospital Auxiliary workers. The Thrift Shop was built on Broadway in 1966 with all proceeds going to help the hospital with extra expenses. Nakusp’s citizens and the Hospital Auxiliary can be proud of the work put in by all to help support the hospitals. All gave what they could in labour or funds to have hospitals that were second to none for the best patient care anywhere. Halcyon Intermediate Care Home, which opened in 1981, gave our elderly people a place to stay in town so that family could visit often, rather than have to live outside our area. It is disappointment to all who have worked so hard to keep our hospital and intermediate care facility, that changes will be made with little thought of the effects to the elderly and caring families.